This article is about black flies in the family Simuliidae. For other uses, see Blackfly (disambiguation). A black fly (sometimes called a blandford fly, buffalo gnat, turkey gnat, or white socks) is any member of the family Simuliidae of the Culicomorpha infraorder. They are related to the Ceratopogonidae, Chironomidae, and Thaumaleidae. Over 1,800 species of black flies are known (of which 11 are extinct). Most species belong to the immense genus Simulium. Most black flies gain nourishment by feeding on the blood of mammals, including humans, although the males feed mainly on nectar. They are usually small, black or gray, with short legs, and antennae. They are a common nuisance for humans, and many U.S. states have programs to suppress the black fly population. They spread several diseases, including river blindness in Africa (Simulium damnosum and S. neavei) and the Americas (S. callidum and S. metallicum in Central America, S. ochraceum in Central and South America). Eggs are laid in running water, and the larvae attach themselves to rocks. Breeding success is highly sensitive to water pollution. The larvae use tiny hooks at the ends of their abdomens to hold on to the substrate, using silk holdfasts and threads to move or hold their place. They have foldable fans surrounding their mouths. The fans expand when feeding, catching passing debris (small organic particles, algae, and bacteria). The larva scrapes the fan's catch into its mouth every few seconds. Black flies depend on lotic habitats to bring food to them. They will pupate under water and then emerge in a bubble of air as flying adults. They are often preyed upon by trout during emergence. The larva of some South African species are known to be phoretic on mayfly nymphs. Adult males feed on nectar, while females exhibit anautogeny and feed on blood before laying eggs. Some species in Africa can range as far as 40 mi (64 km) from aquatic breeding sites in search of their blood meals, while other species have more limited ranges. Different species prefer different host sources for their blood meals, which is sometimes reflected in the common name for the species. They feed in the daytime, preferably when wind speeds are low. Black flies may be either univoltine or multivoltine, depending on the species. The number of generations a particular pest species has each year tends to correlate with the intensity of human efforts to control those pests. Work conducted at Portsmouth University in 1986–1987 indicates Simulium spp. create highly acidic conditions within their midguts. This basic environment provides conditions ideally suited to bacteria that metabolise cellulose. Insects cannot metabolise cellulose independently, but the presence of these bacteria allow cellulose to be metabolised into basic sugars. This provides nutrition to the black fly larvae, as well as the bacteria. This symbiotic relationship indicates a specific adaptation, as fresh-flowing streams could not provide sufficient nutrition to the growing larva in any other way. In the wetter parts of the northern latitudes of North America, including parts of Canada, New England, Minnesota, and the Upper Peninsula of Michigan, black fly populations swell from late April to July, becoming a nuisance to humans engaging in common outdoor activities, such as gardening, boating, camping, and backpacking. They can also be a significant nuisance in mountainous areas. Black flies are a scourge to livestock in Canada, causing weight loss in cattle and sometimes death. Pennsylvania, in the United States, operates the largest single black fly control program in North America. The program is seen as beneficial to both the quality of life for residents and to the state's tourism industry. 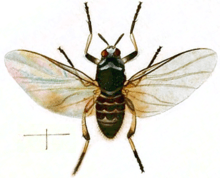 The Blandford fly (Simulium posticatum) in England was once a public health problem in the area around Blandford Forum, Dorset, due to its large numbers and the painful lesions caused by its bite. It was eventually controlled by carefully targeted applications of Bacillus thuringiensis israelensis. In 2010, a summer surge of insect bites blamed on the Blandford fly required many who had been bitten to be treated in a hospital. The New Zealand "sandflies" are actually black flies of the species Austrosimulium australense and A. ungulatum. In parts of Scotland, various species of black flies are a nuisance and bite humans, mainly between May and September. They are found mainly in mixed birch and juniper woodlands, and at lower levels in pine forests, moorlands, and pastures. Bites are most often found on the head, neck, and back. They also frequently land on legs and arms. Only four genera in the Simuliidae family, Simulium, Prosimulium, Austrosimulium, and Cnephia, contain species that feed on people, though other species prefer to feed on other mammals or on birds. Simulium, the type genus, is the most widespread and is a vector for several diseases, including river blindness. Mature adults can disperse tens or hundreds of kilometers from their breeding grounds in fresh flowing water, under their own power and assisted by prevailing winds, complicating control efforts. Swarming behavior can make outdoor activities unpleasant or intolerable, and can affect livestock production. During the 18th century, the "Golubatz fly" (Simulium colombaschense) was a notorious pest in central Europe. Even non-biting clouds of black flies, whether composed of males or of species that do not feed on humans or do not require a blood meal before egg laying, can form a nuisance by swarming into orifices. Bites are shallow and accomplished by first stretching the skin using teeth on the labrum and then abrading it with the maxillae and mandibles, cutting the skin and rupturing its fine capillaries. Feeding is facilitated by a powerful anticoagulant in the flies' saliva, which also partially numbs the site of the bite, reducing the host's awareness of being bitten and thereby extending the flies' feeding time. Biting flies feed during daylight hours only and tend to zero in on areas of thinner skin, such as the nape of the neck or ears and ankles. Itching and localized swelling and inflammation sometimes occurs at the site of a bite. Swelling can be quite pronounced depending on the species and the individual's immune response, and irritation may persist for weeks. 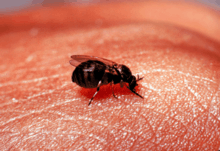 Intense feeding can cause "black fly fever", with headache, nausea, fever, swollen lymph nodes, and aching joints; these symptoms are probably a reaction to a compound from the flies' salivary glands. Less common severe allergic reactions may require hospitalization. Repellents provide some protection against biting flies. Products containing the active ingredient DEET (N,N-diethyl-meta-toluamide) or picaridin are most effective. However, given the limited effectiveness of repellents, protecting oneself against biting flies requires taking additional measures, such as avoiding areas inhabited by the flies, avoiding peak biting times, and wearing heavy-duty, light-colored clothing, including long-sleeve shirts, long pants and hats. When black flies, for example, are numerous and unavoidable, netting that covers the head, like the “bee bonnets” used by beekeepers, can provide protection. Black flies are central to the transmission of the parasitic nematode Onchocerca volvulus which causes onchocerciasis, or "river blindness". It serves as the larval host for the nematode and acts as the vector by which the disease is spread. The parasite lives on human skin and is transmitted to the black fly during feeding. ↑ Daley, Beth (2008-06-23). "Black flies surge in Maine's clean rivers". Boston Globe. Retrieved 2008-06-23. ↑ The Canadian Encyclopedia: Black Fly Archived September 30, 2007, at the Wayback Machine. ↑ "Black Fly". Depweb.state.pa.us. Retrieved 2012-02-15. ↑ "Blandford's Most pernicious beast". Dorset Life. Retrieved 6 September 2016. ↑ Hough, Andrew (2010-07-29). "Blandford fly: surge in 'infected' insect bites blamed on new superfly". The Daily Telegraph. London. ↑ "1. Sandflies: New Zealand's blackflies - Sandflies and mosquitoes - Te Ara Encyclopedia of New Zealand". Teara.govt.nz. 2009-03-01. Retrieved 2012-02-15. ↑ Thompson, F. Christian (March 2001). "The Name of the Type Species of Simulium (Diptera: Simuliidae): an historical footnote". Entomological News. 112 (2): 125. Retrieved 2011-04-08. ↑ Mullen, Gary; Durden, Lance (2009). Medical and Veterinary Entomology. Academic Press. ISBN 978-0-12-372500-4. 1 2 Service, MW (2008). Medical Entomology for Students. Cambridge University Press. pp. 81–92. ISBN 978-0-521-70928-6. Kurtak, D. C. 1973. Observations on filter feeding by the larvae of black flies. PhD thesis. Cornell Univ., Ithaca. 157 pp. Kurtak, D. C. 1978. Efficiency of filter feeding of black fly larvae. Can. J. ZooL 56:1608-23 110.